I am drawn to the magic of the desert. So I decided it was finally time go. Without much of a plan Alex and I hopped on a plane thinking New Mexico would fill in the blanks. We stayed at Ojo Cliente Mineral Springs Resort & Spa in the north cottages which were perfect; not super fancy but with a chic-rustic-comfort. Staying at the spa the whole trip instead of moving around was one of the best decisions we made. I truly felt like we were able to relax and take in the scenery. We would adventure during the day and then come "home" in the evening and enjoy the mud baths and mineral springs, then eat tasty food at the wine bar. The scenery around Abiquiu as we saw from the top of Chimney Rock at Ghost Ranch was breathtaking. There is magic imbedded in those rocks, I'm certain of it. Mix that with the silence, wind, and heat and you've got yourself a spiritual awakening. Alex was more keen on the hike than me, I was wearing TOMS and all we had was warm water in an old Gatorade bottle. But once we started hiking and getting further away from the people down below something inside me changed and I remembered "outdoor Steph." That chick who loves hiking, getting dirty, and putting sticks in her hair. When we came off that ridge we felt like we had accomplished something, like we actually earned the right to eat food, drink cold water, and tasty beers. The only thing I had planned in advance was to take the private tour of Georgia O'keeffe's house and studio in Abiquiu, NM. This experience turned out to be much more important and inspiring to me than I had realized it would. I respect Georgia O'keeffe and the way she chose to live her life; her way. 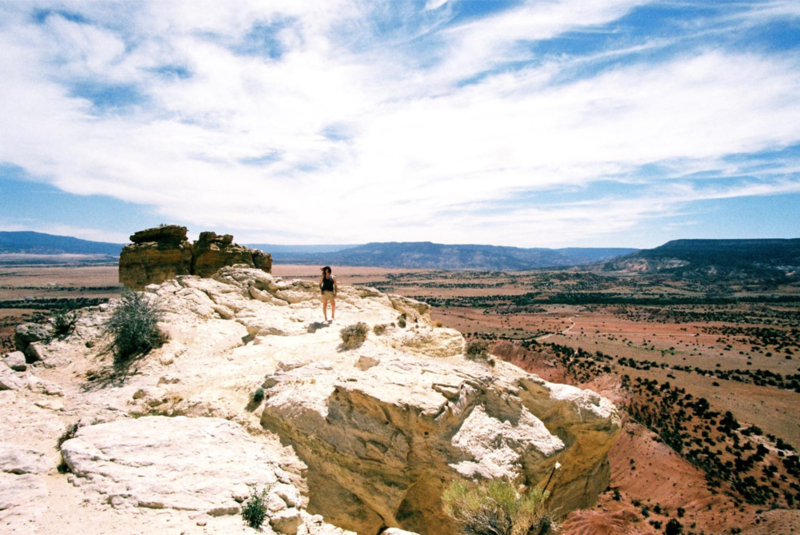 She found something in New Mexico that she connected with and decided to build a life there. It was surreal standing outside that very window you see below taking a peak into her life that has been frozen in time. Seeing her records and stereo (she loved music and had one in every room), and her minimalist/nomadic decor mixed with adobe and wood was simply perfection. The guide said that she built those three windows so that she could look out at that tree and it would be framed like a Japanese three panel screen. Brilliant. We stood in her courtyard with sweat dripping down our faces in full sun. The same courtyard where this famous portrait was taken and where she painted Black Door With Red. I just couldn't believe where we were and how sacred it all felt. I understood fully in that moment that we create the life we want to live and I secretly vowed to myself to always be wild. O'Keeffe inside her beloved Ghost Ranch home in Abiquiu, New Mexico, as photographed by Karsh, 1957. It's hard to capture the whole experience here but this trip changed my life. It woke me up and reminded me of the person I have always been and the person I want to be moving forward.